This is my winter boat version of your Roasted Root Veggies. 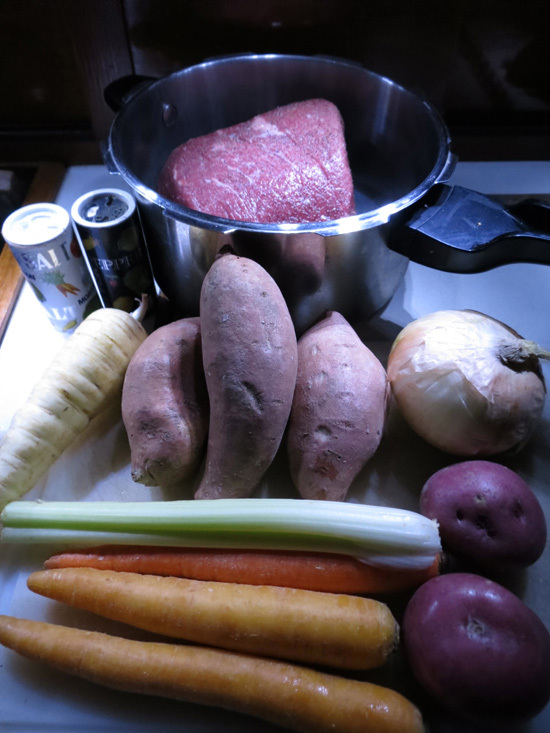 Growing up in an Irish family, meat and potatoes were the steady mainstay of our meals. One of the most memorable versions of this was my Mom’s pot roast with potatoes, carrots and onions. Often she made it in the slow cooker, filling the crock pot the night before, so in the morning with only a flip of a switch dinner was started. Other times she would use a pressure cooker with a heavy weighted top on the lid. Going in the kitchen while she pressure cooked was always an intense experience. Her nervously yelling to “STAND BACK!!! IT COULD BLOW!! !” as she raised the weight off the lid and a plume of steam came venting out. This may be why I was first hesitant to learn pressure cooking, but now that I have – I love it! It’s perfect for boat cooking, because of its fast cooking time that still tastes slow cooked, it doesn’t need to plug-in, it uses less fuel and the lid locks so even at sea, it can’t spill, burn you and otherwise make a mess. Almost nothing could be easier. Simple food, with simple and versatile ingredients. I put a 3 LB Rump Round Roast in the bottom of my pressure cooker venting tray (a little lid with vents on the bottom of the pressure cooker pot). Salt & Pepper meat. IMPORTANT STEP: You have to add liquid to the pot to create the steam that does the pressure cooking. Add enough liquid to come up just under the vent lid (1 – 2 cups). You can use any liquid you want, but in this stew I used Tawny Port Red Wine, a sweet dessert wine I got as a gift from work. It made an amazing gravy with it’s complex flavors. Dice up your veggies to a uniform size. I used hearty root vegetables that hold up well to the cooking time: Onion, Carrot, Parsnip, Sweet Potato, Red Potatoes, Celery (I forgot Garlic). Fill up the pot with as much as space will allow. I threw in dried Rosemary I have left over from the miniature herb cone that was my Christmas tree this year. To cook I turn the flame up to Med-High till the weight on the lid begins to dance around, then turn it down to Med-Low for 20 min. After 20 minutes I turn the flame off, but it continues to cook until the pressure comes down enough to unlock the lid, another 20-30 minutes. I scooped out the veggies, and put the meat on a carving board. In a cup I mixed 2 Tbsp of Cornstarch with water till it blended smooth. Turn the heat back on the remaining juices and bring to a simmer. Slowly stir in the cornstarch mixture, constantly stirring the gravy for 5 min. You’ll notice it change consistency and color, thickening up when it is ready. Filled up a big bowl with meat, veggies and gravy and serve with a crusty warm bread for sopping it all up. A spoonful of horseradish is an excellent complimentary condiment. We warm our’s on the fireplace. Hearty and plenty of left overs. Dug the seeds out of a fresh pom and stirred them into a simmer sauce. I cooked this on medium low for 25 minutes. Don’t overcook so the juicy seeds burst in your mouth. This dish was so delicious, I think it will become a mainstay for the Fall. The sauce comes off like a tangy sweet, slightly spicy and savory barbecue.